A natural consequence of fuel combustion is deposit build-up. However, there’s a catch. These deposits have a detrimental effect on the reliability and performance of your engine as a whole. 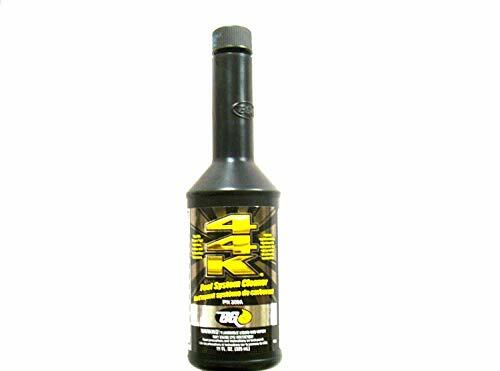 The best fuel injector cleaner has the ability to bring your engine back to their pristine condition by cleaning the internal components as well as restoring fuel economy. Investing in one is a wise choice for you to bring back the vigor and potency of your engine that it once had when it’s still brand new. This article is your one-stop guide in acquiring massive information about fuel injector cleaners – from what it is to how it works. You’ll also learn about determining the right time to clean your fuel injector. Moreover, you will be escorted by the buying guide section in choosing one. Why Should We Buy A Fuel Injector Cleaner? When Is The Right Time Needs To Use A Fuel Injector Cleaner? One of the greatest misconceptions of car owners is that the eventual loss of engine performance is due to their aging car. In most cases, that is NOT the truth. Little did they know that loss of economy and performance is significantly due to the carbon deposits that accumulated in their engines. And NOT because they’re cars are old. This is where fuel injector cleaners come into the picture – to alleviate the problem and put an end to the carbon deposits. Fuel injector cleaners are additives that are mainly cleaning chemicals formulated to stop clogs and build-ups before they become unsurmountable. Simply put, this fluid is the solution to numerous engine problems. This additive can break down existing deposits known as carbon build-ups. Since it can remove carbon, the fluid is able to prevent misfires, stumbling, and ultimately engine hesitation. Fluid injector cleaners can also clear the intake, allowing more air and catalysts for maximum air-fuel mixture. That means you can no longer experience slow acceleration. Further, the absence of deposits creates a more consistent air flow. So no more rough idles. Fuel injector cleaners may not be the answer to all your engine problems but they sure can handle numerous engine issues that slowly occurred over time. One of the most frequently asked questions by car owners is, “Do I really have to buy a fuel injector cleaner?” The answer is an absolute yes. If you really want to notice a difference in the way your car performs than it is before, then you have to try one. Using a fuel injector cleaner is a guaranteed way of making your vehicle run way better after the application. Here are other reasons why you should try one. Basically, the colder your area is, the more reasons you have to use a treatment. Cold temperature and a lot of short trips can aggravate the carbon deposit formation inside your engine. The volume of carbon deposit can rise up to a harmful level, robbing your vehicle of fuel economy and performance. Fuels nowadays are meticulously engineered to efficiently sustain modern engines. One downside, however, is they have become less stable than ever before. You can blame the octane-boosting ingredient – ethanol. This substance emulsifies and oxidizes to create non-combustible by-products. It may not be harmful at first. But overtime, the deposit can build-up to a critical level, resulting in a dramatic loss in fuel economy, deprived engine performance, hard starts, increased emissions, and a whole lot more of problems. If you own a modern car, there’s a great chance you are using gasoline that contains ethanol, which is pretty much everybody these days. As you may already know, ethanol is the reason behind the carbon deposits in your engine. The situation becomes worse when you are a city driver where you often stop and go due to the traffic conditions. Who doesn’t want the best for their cars? Using a fuel injector cleaner is like giving your car or truck what it deserves. Once the fluid is mixed inside your engine, it will actively battle against carbon deposits. Some manufacturers even boast their fluid to deal with carbon deposits in a molecular level which is a great plus. Perks include a boost in fuel economy, enhanced engine power, stable starts, and no more hesitations. Additionally, you can also experience improved throttling, smoother idling, and reduced cranking time. Fuel injector cleaners can truly live up to their name. They are effective at eliminating these harmful deposits when applied on a regular basis. Because of their purpose, you can easily consider these fuel additives as one of the most important fluids for your engine. If you are a fan do-it-yourself stuff, then you will surely rejoice that using this fluid treatment is just a piece of cake. If there’s something not right with your car, the very first thing you would surely like to hear is “it’s easy to deal with.” Fortunately, applying fuel injector cleaners will not require you to call for a mechanic. Unless you haven’t used a ketchup ever in your life, then you will have a hard time using this solution. All you have to do is to simply pour the bottle right into your gas tank. Make sure it’s in full tank first. One thing that makes this product quite interesting is it comes in a double pack without doubling the price. This one is able to save you lots of gas, especially in the long run. It’s also capable of removing hazardous deposits as well as promote better acceleration and restore lost power. The STP 78577-6PK is compatible with all cap-less gas systems thanks to the redesigned fuel additive bottles. 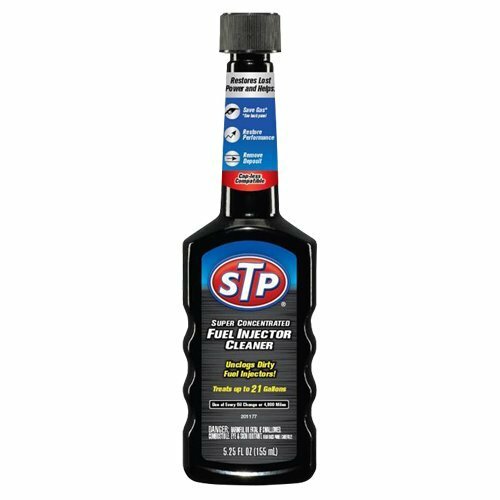 With this STP fuel additive, you can keep certain problems from happening such as weak acceleration and rough idling. If you don’t want to experience frequent stalling and stumbling, then you might want to use this one. This product is composed of concentrated detergent that effectively gets rid of damaging varnish, gum, and carbon deposits in your fuel injector. It does its job by efficiently dissolving these unwanted debris build-up. Without this STP, you are putting your engine in a detrimental condition, causing hard starts and other unwanted scenarios. This one is detergent-based, making it safe for your fuel sensors and other systems. One bottle would be enough to acquire your desired results. Moreover, the STP 78577-6PK is proven to be compatible with newer catalytic converters and engines due to its mildly aggressive formula with less PEA (polyether amines). Overall, getting this one is truly a bang for the buck because you will be getting two bottles for a single price. Now this one’s another effective fighter against deposits as it comes with one of the most effective additives ever invented – Techron. Techron is an advance additive technology with a high efficacy of making your engine work at its maximum potential. This patented fuel additive technology is a renowned substance among wise automotive enthusiasts due to the wonders it can do to your engine. That is also the reason why auto manufacturers and mechanics alike trust products containing Techron. This additive is a sure-fire way of getting a better car performance thanks to the cleaning prowess of Techron. There is only one way to make your engine operate at their best – keeping it clean. One thing that makes newer engines more prone to dirt build-up is due to modern designs that function with higher temperatures at finer tolerances. Techron is powerful enough to work down to molecular level and microscopically demolish deposit formation left by low quality gasoline. It also works the same way to prevent impurities to build up. Even the most miniscule engine deposit can already affect the vehicle’s performance quite negatively. This is because newer engines are designed to only work at their maximum efficiency when they are clean. Otherwise, you can expect the performance to degrade. Techron is also proven to work on older engines, and not just the new ones. This additive is the solution to keeping your old engine functional and maintaining good condition throughout the years. Ultimately, with this Chevron, you have an engine that performs way much better than before while maximizing fuel economy and significantly lowering emissions at the same time. Cleans carburetors, injectors, chambers, etc. This one comes in four packs. The BG 44K is yet another remarkable fuel system cleaner that can deliver your desired result. One thing that makes this appealing is it can clean combustion chambers, valves, and fuel injectors in a faster way. A single container can already treat 20 gallons of gasoline. Add this one to your gasoline and you’ll surely notice your engine to perform way better than it did before. The BG 44K offers effective removal of all types of engine deposits. As a result, you have something that prevents stumbles, stalling, and surges. You can also observe that you no longer have to deal with power loss and hesitation. The BG 44K is most effective when it comes to improving your driving experience by restoring engine performance. This one is specially formulated to fight corrosive deposits settling in your fuel sending unit. It can also do a fast clean up to bring back your coked fuel injectors back to their cleanest state. This brand may not be as popular as other names in the industry such as STP, Liqui Moly, and Royal Purple; but it’s still something that car manufacturers themselves recommend. The BG 44K is safe to use on oxygen sensors and catalytic converters. In addition, this one is compatible with common fuel additives, alcohol-mixed fuels, and all fuel system materials. Now this one’s a promising fuel system cleaner. The Royal Purple is a three-in-one fuel additive designed to boost your vehicle’s performance as well as clean your engine simultaneously. It impressively heightens your horse power by as much as 2.6 percent as well as enrich fuel economy by up to 3.2 percent. Using the Royal Purple will keep you from experiencing occasional stalling, frequent hesitation, and that annoying rough idle. What makes this product quite appealing is its ability to significantly reduce carbon oxide, nitrogen oxide, and hydrocarbon at an average of 18, 13, and 12 percent respectively. This is just few of the many other performance advantages this Royal Purple can boast. The Max-Clean is an advanced synthetic fuel system cleaner that optimizes your fuel system’s function to the highest level possible. It does its job by restoring fuel economy and actively penetrating carburetors, injectors, combustion chambers, and intake valves. Max-Clean is a state-of-the-art treatment that can easily get rid of emission and build-up both on the tailpipe and the engine. This treatment can be used in the whole spectrum of engines that exists today – whether old or new, diesel or gasoline, supercharged or turbocharged, or naturally aspirated. When it comes to safety and compliance, Max-Clean is more than compliant. It can be utilized with all biofuel and ethanol blends and can be used in both 2-cycle and 4-cycle engines and will never put your car emissions equipment in harm’s way. 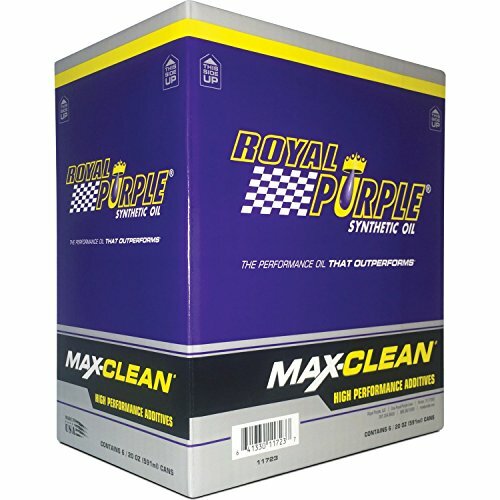 Overall, the Royal Purple Max-Clean is the perfect solution if you’re looking for a treatment that virtually has everything when it comes to usage and advantages. The Sea Foam is genuinely effective in battling even the smallest amounts of moisture that can possibly lead to damaging water mixtures and corrosive fuel. This EPA registered product is a hundred percent pure petroleum and has the ability to eradicate deposits and other internal engine contaminants. You can apply the Sea Foam into your carburetor, fuel tank, or crankcase. This could be the solution if you are looking for something to let go of sticky rings and lifters. This can also effectively clean fuel and valve systems and is ideal for use for every 5000 miles. Though it comes in a simple container that looks like a drinking bottle, Sea Foam is actually a popular choice among consumers and is one of the best sellers. It got a couple of thousand reviews and eighty percent of those ratings are amazingly five-stars. Sea foam can be used in virtually all kinds of engines, even in your boat. It works quite well on trucks and cars; you can’t find any reason why you shouldn’t have this one. You can utilize this one both on 4-stroke and 2-stroke engines. It is advisable to use Sea Foam one week before you do an oil change. Keep this tip in mind especially if you are still new to this DIY stuff. Just drop half of the container into your crankcase a week before you actually change oil. With that in mind, it is also advisable to order this item ahead of your scheduled maintenance. There are claims the delivery services can be slower sometimes and you don’t want your package to arrive three days after you’ve changed your oil. Now this one looks like your conventional fuel treatment you have grown up with. It comes in a one-gallon container that looks so humble and classic, you can easily trust this one. 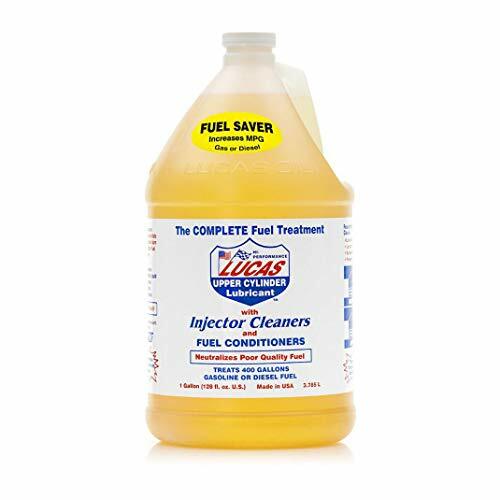 The Lucas can effectively lubricate and clean your entire fuel system. It does its job by burning excess exhaust emissions which lead to a dramatic increase in power as well as heighten your miles per gallon. Along with that, it increases the life of your injectors and pumps. The Lucas can also significantly boost the overall performance of your engine. You can almost hear the difference of how smoother your engine works after applying this treatment. Some users even claim they have a faster response when they hit the accelerator. It’s probably the extra power boasted by the product but one thing’s for sure – this treatment really works. You will also notice your vehicle to run better and will idle much more smoothly when you use this one. When your engine is operating well, you can expect it to run on more power and less problems will occur. Correspondingly, you will save tons of money since you’ll be dealing with little-to-no repairs and engine problems, making your purchase quite worth it. Since it’s a lubricant, be careful not to spill the item on the floor of your vehicle, especially if there are times you want to store one in your trunk. It is highly difficult to get the thing off your carpet plus this one is flammable so you have to be cautious when handling the item. Replace your trunk mat if you happen to spill this. 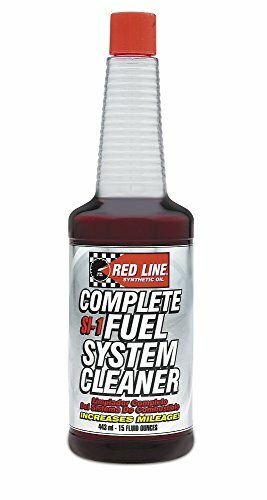 The Complete Fuel System Cleaner from Red Line can easily live up to its name. It can really offer a “complete” service in your engine to the point it will perform like new. This treatment is effective in terms of lubricating valves and upper cylinders as well as clean carburetors and injectors quite efficiently. Further, it’s also effective in clearing out rusts in your fuel system and simultaneously clean deposits in your intake valve and emission control systems. With the Red Line Complete, you can also expect an improved gasoline stability with significant reduction in run-on and pre-ignition. This treatment is a concentrated result of combining the most powerful high-temperature detergents ever available. The fusion of this superior detergents produces the best solution to clean combustion chambers and intake valves. A single treatment can already decontaminate injectors to a near one-hundred percent percentage. Depending on the injector condition, the result is so significant that it can heighten fuel economy by a staggering 12 percent and even greater in other applications! Apart from the strong detergents, the treatment also contains a synthetic upper cylinder lubricant that actively assists the pollution valves. The same substance can promote less octane consumption by two numbers. In addition, the SI-1 is purely safe for continuous use on all types of gasoline vehicles. The SI-1 contains more PEA (polyetheramines) than other cleaners, making it one of the most effective cleaners available today. Matter of fact, this Red Line consists the highest quantity per dollar of critical fuel system cleaning compounds called as PEA according to the manufacturer. This makes the product better than low-end STP fuel cleaners. Actively cleans carburetors, fuel, injectors, etc. You already know its wonders so you might be wondering how this fluid works in the background. A fuel injector cleaner is composed of solvents and other ingredients. But the most important component existing in the fluid solution is polyetheramine or PEA. Polyetheramine is the active ingredient that demolishes and eliminates the carbon deposits. One unique attribute of the PEA is it’s actually the ONLY known substance that is effective for the purpose it fulfils. The fuel injector cleaner contains detergents. These detergents go to the deposits and break them into miniscule particulates. The engine can then flush it through the exhaust system. The principle is quite similar to how laundry soaps deal with the stains in your clothes. Refer: White Smoke From Exhaust – Causes & How To Fix? The role of the polyetheramine is to solubilize the carbon deposits. This will make the deposits easy to flush away. After being solubilized, the particulates of carbon are burned through the normal combustion process. What makes the PEA quite impressive is they are surface active by nature. This means the polyetheramine detergents can not only remove the deposits away, they are also able to prevent future formation of carbon deposits. PEA is the most effective among all types of fuel-additive detergents. There are detergents that can take away the carbon in their place, but are not entirely effective in turning them into particulates. As a result, they are removed only in small pieces. These solid pieces of carbon can get lodged in the exhaust valves and catalysts. They can also clog injectors, doing more harm than good. With polyetheramine, you have an active substance that not only gets rid the deposits, but also transforms carbon into a soluble state so it can easily flow within the system and be disposed in the exhaust eventually. While it’s fairly easy to pick one item and buy it, it is wiser to consider some factors first before finally deciding which treatment is possibly the best for your vehicle or any fuel-powered machine for that matter. If there’s one thing you can notice, it’s the clear fact that manufacturers are trying their best to convince customers into buying their product, and they do so by luring potential consumers into their respective packages. There are fuel system cleaners that you can buy per gallon for a very low price. There are also some cleaners that come in two bottles in a single purchase. Finally, there are also brands that come in certain multiple packs per package. It all boils down to how well you need the product. If you have a shop and intends to offer services for multiple vehicles in a daily basis, then you can go for an industrial-size package. However, personal use will only require you to purchase something for small-scale applications. Remember, fuel system cleaners are highly flammable, so it’s not ideal to store tons of these products in your home. Also, make sure you keep this stuff out of children’s way. There are some cleaners that come in water-bottle-shaped containers that some innocent people may confuse with drinking water especially in dark places. Every product has something to boast. In case you headed straight to this buying guide section, you might want to scroll back up to the review section and try to see how each item stands out from the rest. It’s also an ideal way to gather insights as to how each item affects your engine. One important factor you should figure out is the compatibility of the fuel injector cleaner. There are products that are specific for gasoline use only, meaning you can’t use it for diesel-powered variants for obvious reasons. However, this factor still remains as one of the main causes why people are unsatisfied with their purchase. Take this opportunity to be extra careful and choose according to the usage, specs, and fuel type of your engine. Remember, the more high-end your engine is, the more it is sensitive to dirty injectors. So you can’t afford the mistake of pouring something that is not compatible to your engine. There are treatments that are formulated to be extremely aggressive to the extent that it can already harm your catalytic converter. In worse cases, too aggressive fluid can burn that component. So it is important to select something that is ‘friendly’ to your engines. Modern engines now have catalytic converters as an important component working for your vehicle’s exhaust system. Since converters are made to work with fuel fumes, it can be sensitive to the mixture of cleaner and the fuel. This can trigger the ‘check engine light’ to activate. Refer: How To Reset Check Engine Light? There are fuel injector cleaners that are approved by the manufacturer themselves. It would be beneficial if your cleaner is recommended by your vehicle manufacturer. However, there are a lot of treatments that are generally accepted by mechanics so you won’t have a hard time finding one. You should also look out for those products that are proven and tested by some owners. That is one of the best ways of validating the product as great or not. There is actually no universal time-frame that works for all vehicles. There are no specific dates as to when you should clean your fuel injectors. However, all products come with manufacturer’s recommendations in terms of mileage. For instance, there are fuel injector cleaners that are good for every 5000 miles while some brands will suggest usage for every 3000 miles. It sometimes depends on the product you are using. Setting that aside, there are more important factors that tell you it’s the right time to start cleaning your fuel injectors. There are times you shouldn’t wait for the manufacturer’s instructions especially if you already have dirty injectors. If your car has reached a few years old and has already achieved a decent mileage, then it’s time for you to apply its first cleaning fluid treatment. Signs of dirty injectors will include loud engine noises, hard starting, and loss of power. If you are running a diesel powered vehicle, a dirty fuel injector is determined by the color of your exhaust smoke. You can have your car checked on an emission testing center to confirm that you indeed have clogged injectors. You should also use a cleaning fluid after a long stand-by period. When you haven’t used your car for a long time, it’s possible you might experience some issues when you try to use it again. Unfortunately, modern fuels have become less chemically stable than it is before because it contains ethanol – a substance that is vulnerable to characteristic change if left unused for a long time. So how long is ‘long’? Basically, the fuel of cars nowadays won’t already do well after about a month and a half of stagnation. For instance, in case it’s winter and you haven’t used your car at least for that certain period, then you can safely conclude that you already need to drain your old fuel and fill your tank with a new one. This is the perfect time to also add your fuel injector cleaning fluid along with the new fuel. Doing that will drastically help in cleaning your tank and eradicating old fuel at the same time. This will give more space for the new fuel to settle in while ensuring that you’ll have a better performing vehicle after replacing the fuel. After your first use, you can now make fuel injector cleaning a part of your routine maintenance. If you are a frequent city driver, it is advised to clean your injectors at least once a year. City driving have a detrimental effect on the injectors because of the recurrent stopping and going due to the traffic. If you are using a diesel-powered vehicle, it’s advisable to use fuel injector fluids every changing of fuel, air filters, and especially oil. You should also make it part of your service intervals to attain the best results. It’s advisable to clean diesel engines more often than its counterpart because the fuel quality in this category varies. The best fuel injector cleaner is something that delivers what is expected of it – and any of the seven products mentioned above perfectly fits the title. Now it’s up to you to choose one product that is compatible with your vehicle, then you’re good to go.